Little ones don’t stay little forever, much as we might like them to. Sure, they’ll end up decorating the walls with sticky, jammy handprints in the future, but those are less likely to be saved as treasured keepsakes. Capture baby’s hand or foot print in clay, and you’ll have a permanent memory of those tiny fingers and toes forever. 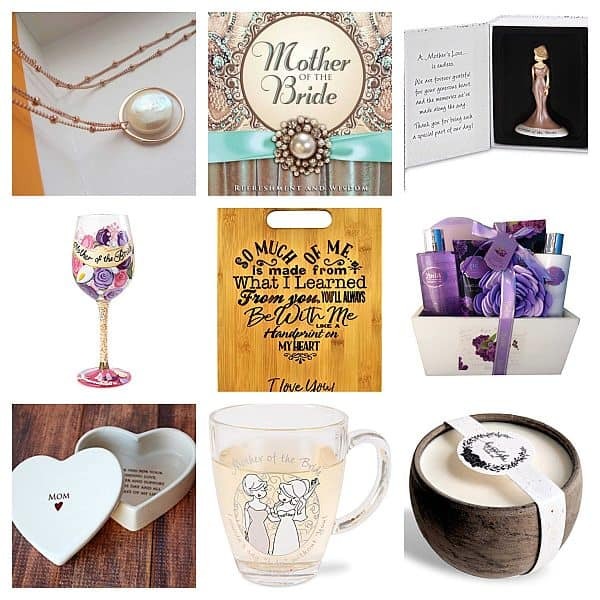 Feeling stuck on what to buy for a little girl’s baptism? This beautiful set takes the guesswork out of gift-giving with a beautiful selection, all in soft shades of pink and white. 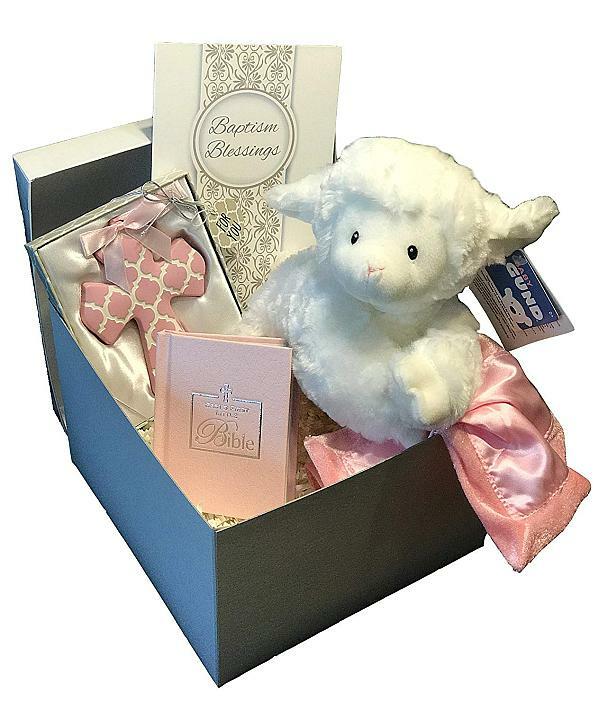 In addition to a cuddle-soft lamb toy, the set also includes a crib cross, baby bible, and more. Is there anything more beautiful than being wrapped up in warm softness? This ultra-soft fleece blanket is an ideal christening gift, and can symbolize the little one being held in God’s gentle, loving embrace. 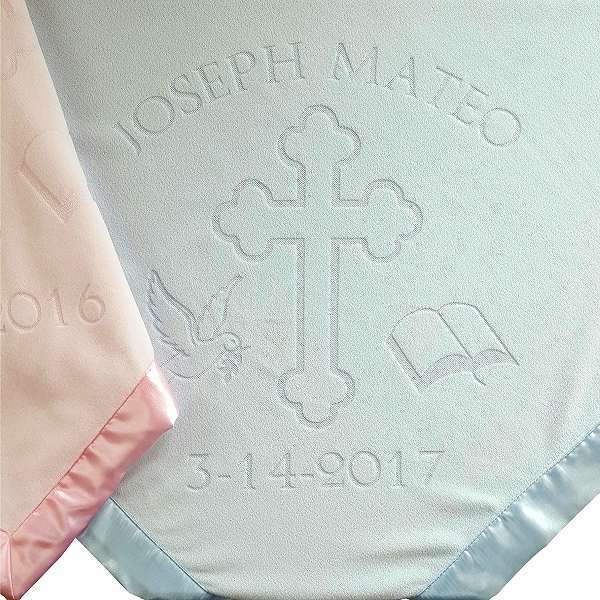 Trimmed in satin, it can be personalized with the baby’s name and baptism date, and is available in pink or blue. Bedtime can be difficult for wee ones as they get used to darkened rooms and quiet time. This book helps to put them at ease, with sweet stories about baby animals who are also getting ready to get to sleep. 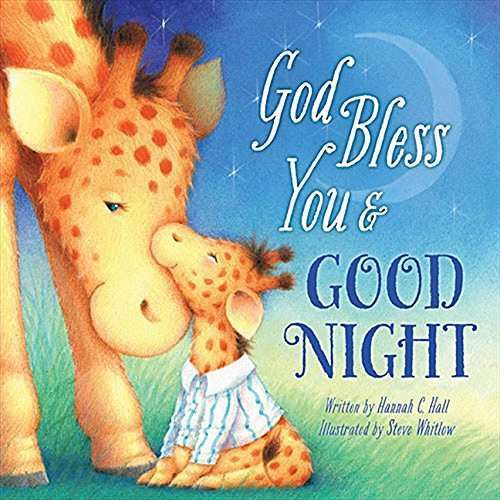 When parents read this book to children at bedtime, they’re all reminded of God’s love, and how much they are all adored, and blessed, and held in His hands. Speaking of sleeping sweetly, this personalized blanket offers both a warm hug and a cuddly friend to cuddle up to. More than just a standard receiving blanket, this has the infant’s name (and a blessing) embroidered onto it, making it an heirloom that they can curl up with for years. The plush lamb’s eyes are made of fabric so they’re safe for baby, and the polyester fabric is breathable and easy to clean. A truly exquisite keepsake gift to celebrate a little girl’s christening. 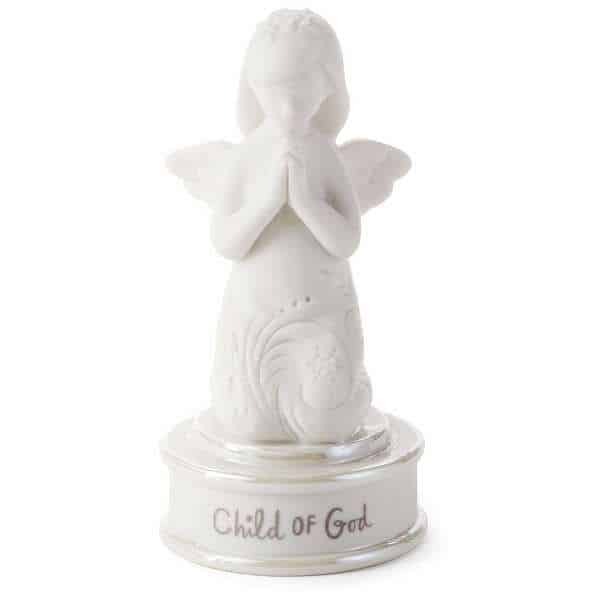 This porcelain figurine features a little female angel kneeling in prayer, decorated with flowers. As the recipient grows up, every glance at this treasure will remind her that she is indeed a Child of God. It can sit on the dresser near her crib today, and one day she can pass it on to her own daughter in turn. 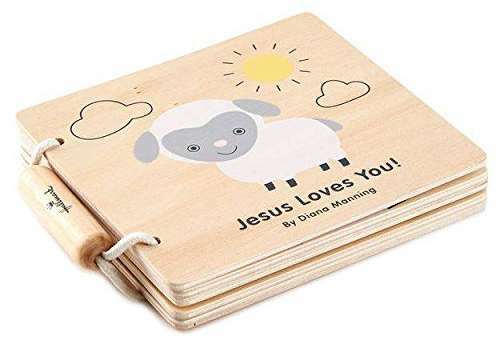 Tiny and sweet, this wooden board book features a little lamb, and a story about Jesus’ love and blessings. Perfect for reading aloud when the child is still a baby, it’s also great for learning how to read when they’re a bit older. A wonderful gift for a slightly older child, this book is filled with sweet, short verses and stories about what it means to be loved and protected in God’s infinite grace. It’s also wonderful for newborns as well, since their parents (grandparents, older siblings, etc.) can read aloud from it, either for a “good morning” ritual, or just before bedtime. 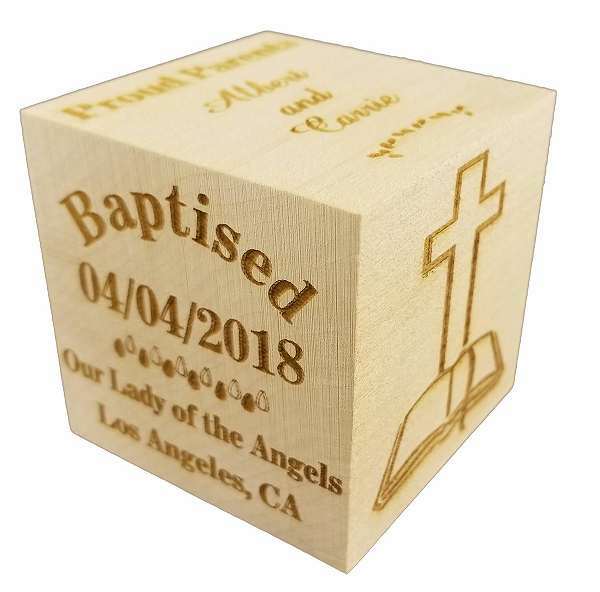 It isn’t often that you get to completely customize a gift, so this wooden block is really quite special. Blocks have been quintessential baby toys for thousands of years, and this one can be engraved with all the information and symbols you’d like to capture forever. Name, baptism date, church name, special messages… the sky’s the limit. Best of all, the wood is natural and unbleached, and made by hand in the USA. A baptism is such an important date in a child’s life, and it’s just as important to let friends and family members in attendance know how much they’re appreciated. These mini rosaries are perfect keepsakes for everyone who has shared in the ceremony. 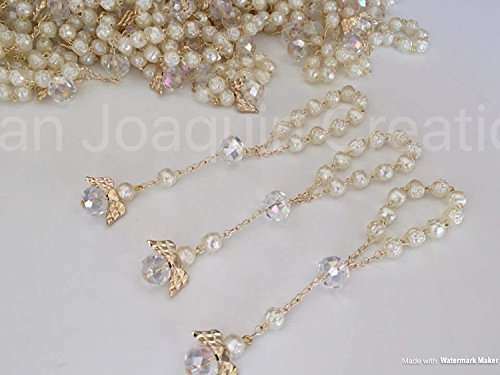 Made with rosebud-shaped ivory beads, each rosary features a tiny crystal angel with gold-plated wings. Next to the baby being christened, the superstars of any baptism are the Godparents. These are the people who have stepped up to act as guardians and nurturers of this little being, as part of its extended spiritual family. 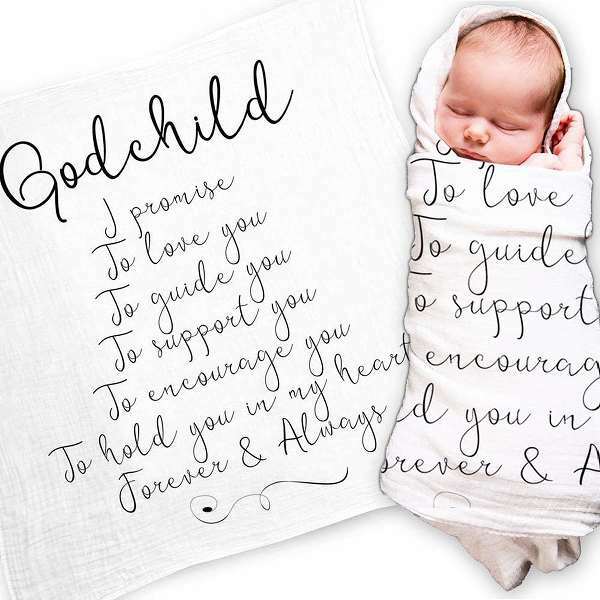 This swaddle blanket expresses the vows that a Godparent swears to fulfil: to love, guide, protect, and encourage the little one. Those words are printed on this 100% cotton blanket, and enfold baby in love and light every time he or she gets wrapped in it. 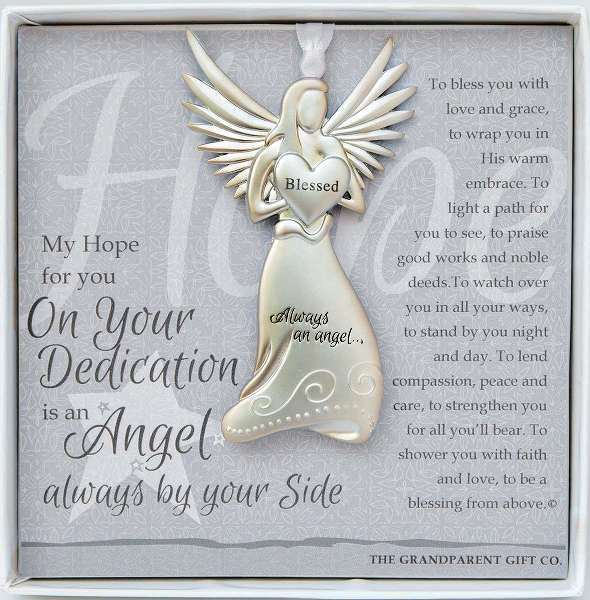 Ideal as either a decoration for the baby’s room, or an ornament for their first Christmas tree, this angel ornament is sure to inspire smiles all around. It comes with a beautiful blessing poem, and at 4” tall, is just the right size to hang on a crib, or over a child’s bed. Who loves elephants? 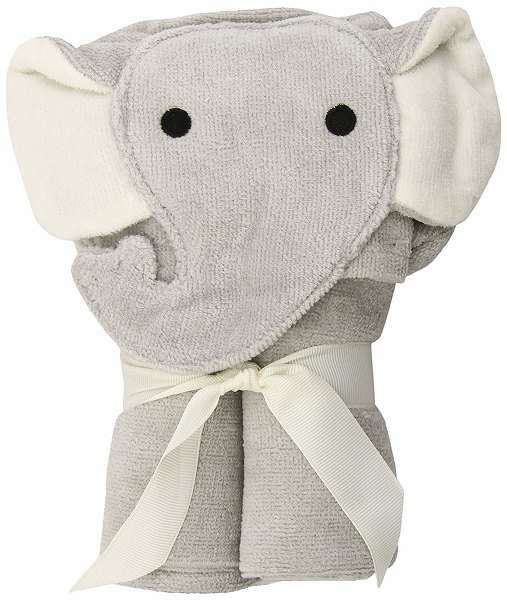 Well, pretty much everyone… and this adorable baby bath wrap features one of the cutest elephants ever. Made of ultra-soft cotton velour terry cloth, it will wrap the little one in cuddly warmth after a bath or a dip in a wading pool. Also ideal for impromptu photo ops. With sheets like these, baby’s going to have the coolest crib in town. 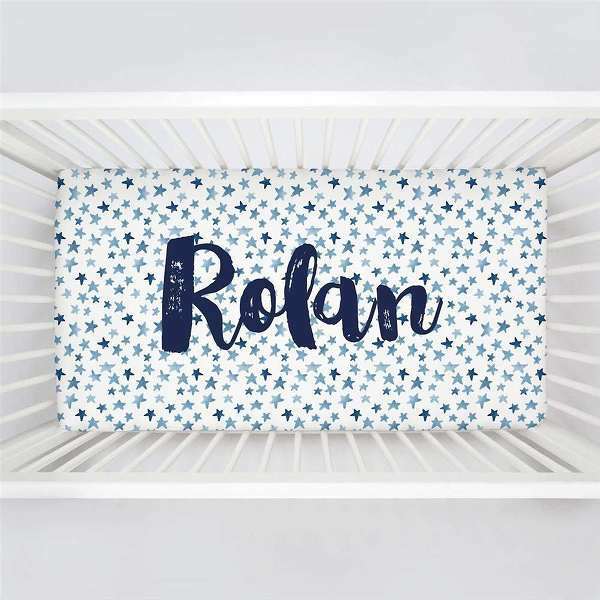 Available in different colors and patterns, this bedding can be customized with the little one’s name, with a variety of different typeface styles to choose from. Not only is this a super-cute gift idea, but it’ll also help exhausted parents remember baby’s name after weeks without sleep. Baby’s christening certificate is too special to be shoved into a filing cabinet along with old tax forms and appliance guides. 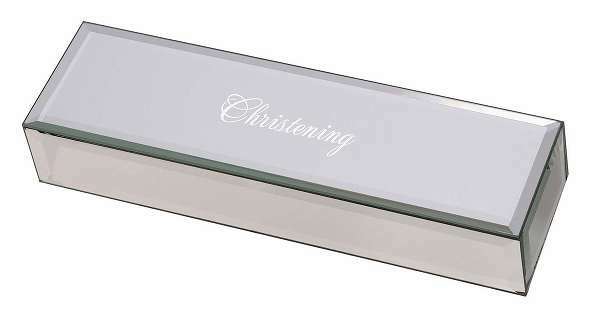 This mirrored glass box is perfect for holding such an important document with the grace and reverence it deserves. Simple and elegant, it’s a wonderful gift for the child’s parents, and can be passed on to the little one when they grow up and have children of their own. So, everyone else is probably going to be lavishing the child with religious gifts… so you can go a different route entirely and aim for something like this instead. 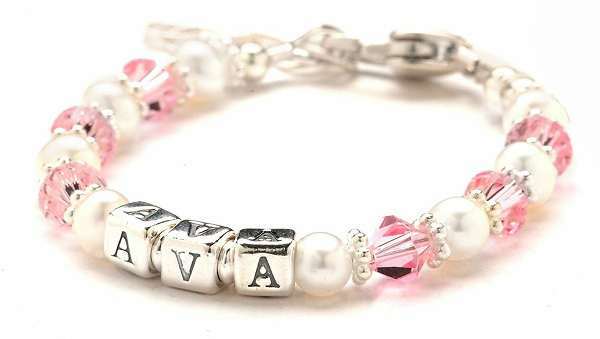 This bracelet, made with pink Swarovski crystals and freshwater pearls, can be customized to spell out the little girl’s name in sterling silver letter beads. Best of all, it comes in different sizes, from baby to pre-teen. 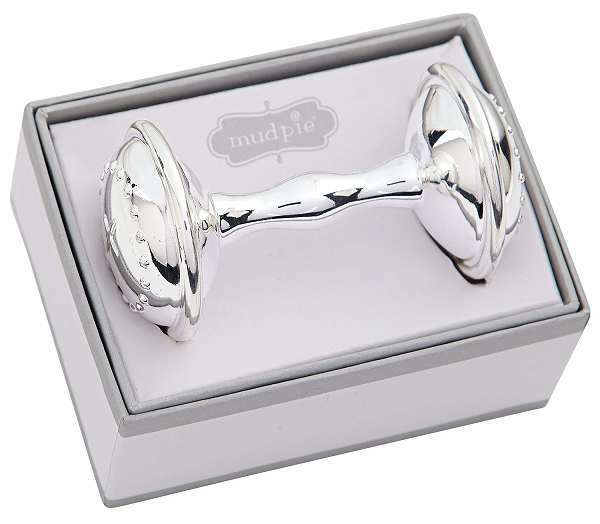 Baby might not have been born with a silver spoon, but he or she can certainly have fun with this silver-plated rattle! Just the right size for an infant to hold, the rattle makes a pleasant sound when shaken, and is durable enough to withstand rough treatment. 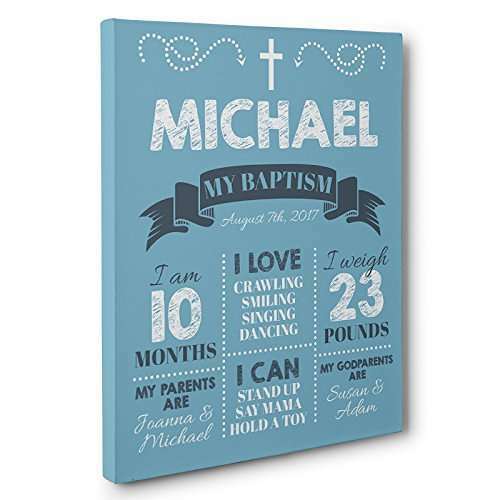 It’s decorated with a cross on each end, making it a wonderful baptism gift for boys and girls alike. What’s cuter than a little baby on their christening day? A quiet baby on their christening day. 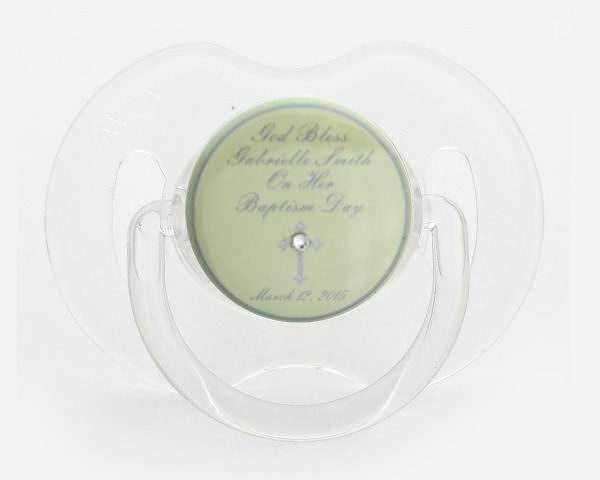 These customizable pacifiers come in four different colors, and are adorned with baby’s name and christening date. BPA-free, lead-free, nontoxic, and CPSA approved, a pacifier like this is sure to soothe the little one, and makes a wonderful keepsake gift. Just about every parent will one day know the panic of trying to search for a dropped pacifier while the little one howls. You can help them avoid this experience with a personalized clip like this one. Made of sterling silver and adorned with white Swarovski crystals and enameled cross, it can clip onto any pacifier type and then attach to the little one’s clothes, car seat, or stroller. It can even be personalized with baby’s name, and guarantees that their binky will never be misplaced ever again. 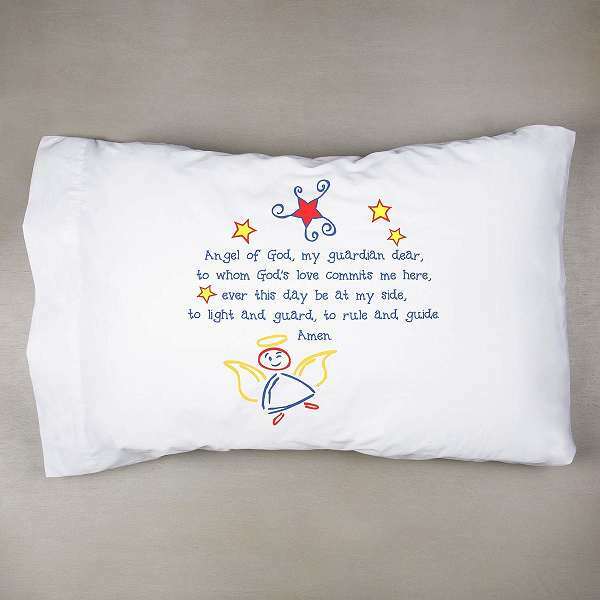 This pillowcase is a gorgeous way to bring faith into a child’s life day and night. A gentle prayer about their guardian angel can be the first thing they see when they wake, and the last thing they see before they drift off into dreamland. It fits any standard-sized pillow, and is a great gift idea for toddlers and older children. Decor gifts are always a great idea, and this canvas would look spectacular in a little boy’s room. Eye-catching typography meets spiritual savvy, with stats about the wee one’s baptism, what he loves to do, and who his Godparents are. It’s sure to stand out amidst all of the other gifts he’ll receive, and can evoke smiles every time he and his parents look up at it. Do you know what’s better than a cute stuffed toy to play with? FOUR cute stuffed toys! Measuring at 4” tall each, these smiling ark characters include a giraffe, lion, elephant, and Noah himself. 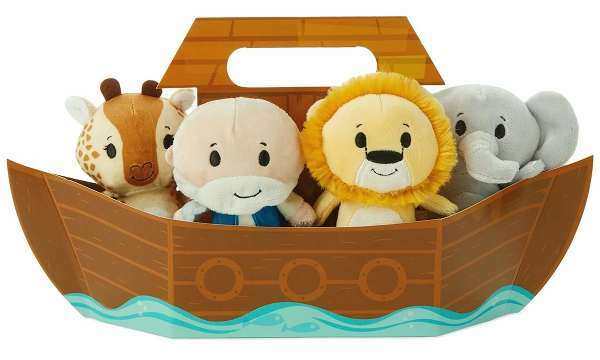 They come in an ark that pulls double duty as a toy, so little ones can learn their Bible stories while staying occupied in play-land for hours. If you have a special, posh gift in mind, let this option inspire you. 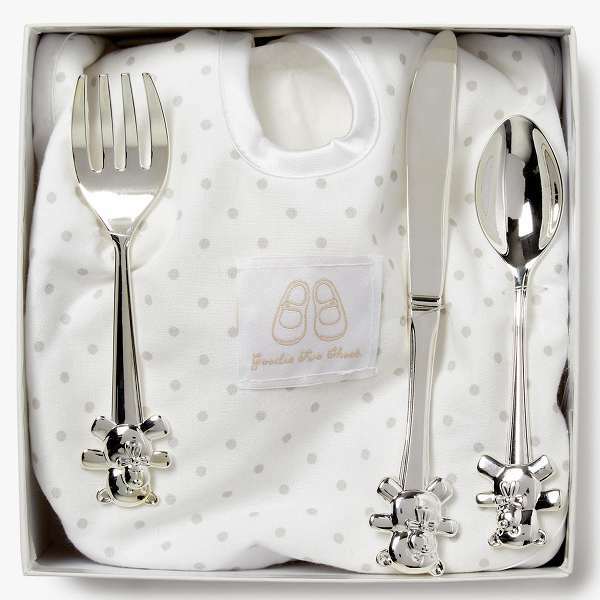 A silver-plated cutlery set consisting of toddler-sized spoon, fork, and butter knife come in a stunning gift box along with a soft cotton bib. Each cutlery piece features a teddy bear on its handle, and is just the right size for a little boy or girl to use. 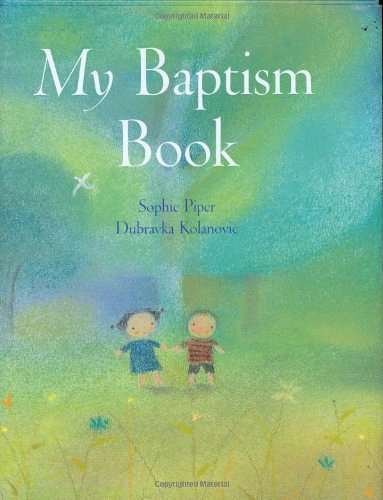 Older children getting baptised need gifts too! 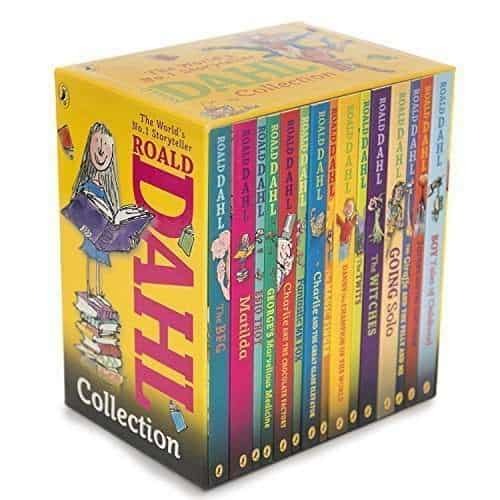 While they might not be too thrilled about silver pacifiers or plush lambs, older kids who like to read would undoubtedly adore this set by Christian author Roald Dahl. 15 books including James and the Giant Peach and Charlie and the Chocolate Factory are sure to please kids and parents alike. A little miracle of glass and glittery snow. 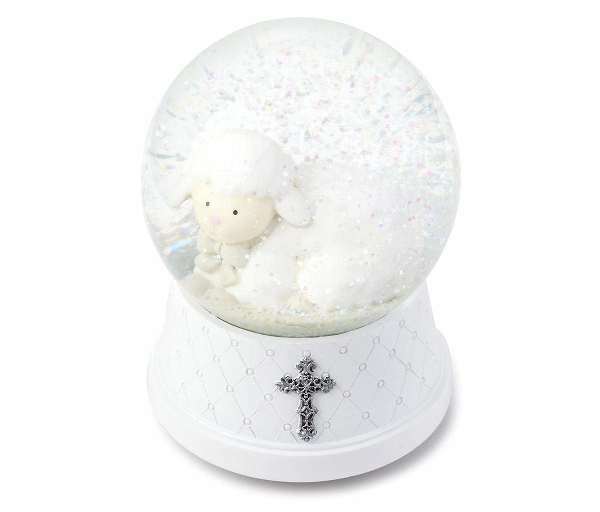 This water globe features a sweet-face lamb nestled in amongst falling snowflakes, and plays the “Jesus Loves Me” melody when turned. It’s a wonderful gift for a newborn baby, and can inspire smiles and comfort in toddlers as well. 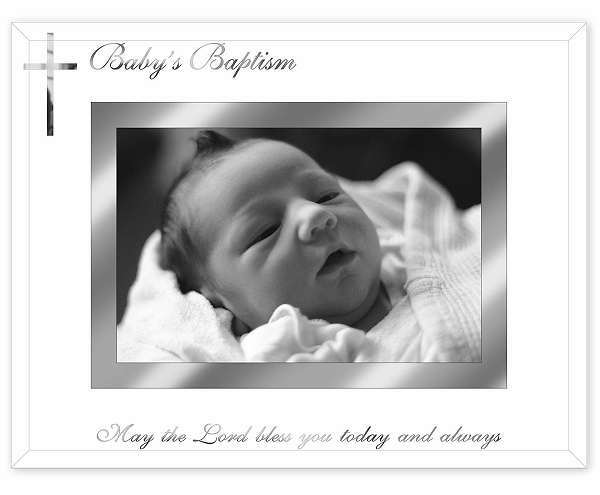 If you’ve been searching for a one-of-a-kind gift for a special baby’s baptism, look no further. This beautiful ceramic jar can be filled with well-wishes, blessings, and kind sentiments from all the friends and family members attending the christening. It can then be sealed up with its cork lid, and either revisited whenever the child needs some extra sweetness, or put somewhere special and presented to them at their first communion or confirmation. 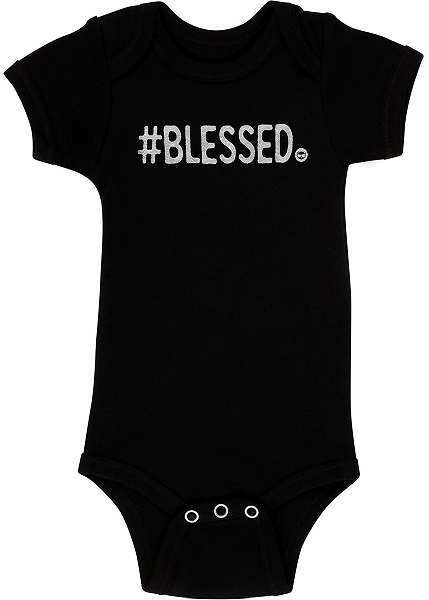 If the recipient’s parents are social media savvy, you can make sure baby joins the hashtag club with an adorable #blessed onesie. Made from thick, soft, 100% cotton, these bodysuits are created by a small business in Los Angeles, CA, and are color-fast and machine washable. Perfect for a post-baptism party, it’s sure to help baby celebrate in style. At just 8” tall, this cuddly plush bear is just the right size to nestle close to a little one at bedtime. Wake me with the morning’s light. Whether to bring them comfort or to help them learn their prayers, it’s a lovely gift for newborns and older children alike. Peter Rabbit has been a cherished children’s character for over a hundred years, and with good reason! 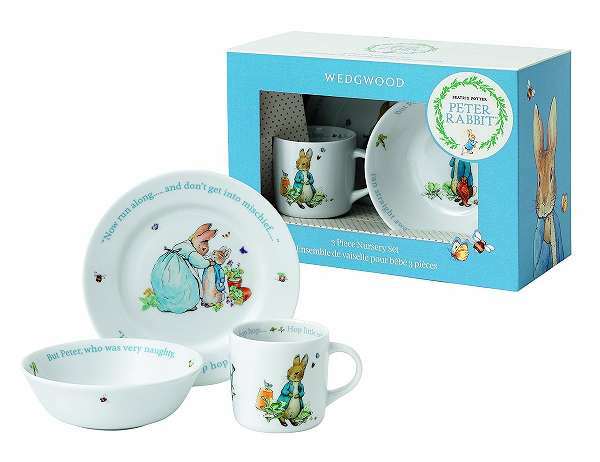 Beatrix Potter’s stories are gentle and sweet… as is this beautiful Wedgewood China dining set. The plate, bowl, and mug are just the right size for little ones to handle, and parents will appreciate the fact that they’re safe for dishwashers and microwaves. This is a unique, sweet gift for both boys and girls that can be enjoyed for years to come. 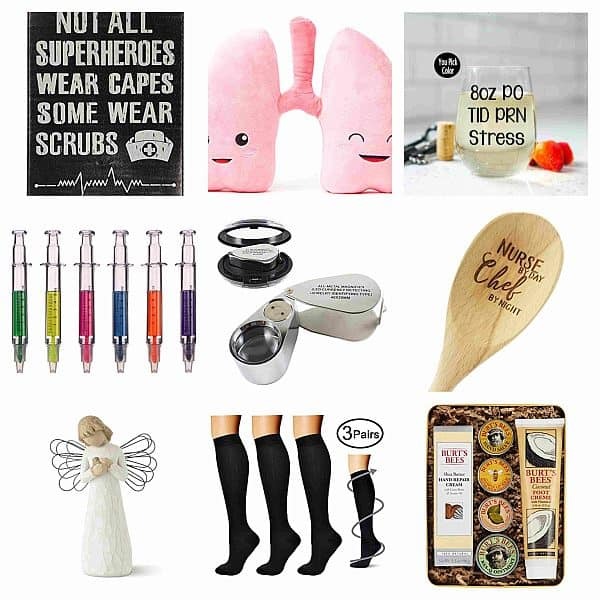 Hopefully you’ve been inspired by this list and have found the perfect item to give the christened child (or their parents) on this special occasion. If you’re so inclined, think of ways in which you can pair some of them together, like the personalized pacifier + pacifier clip, or the baby Bible with Noah’s Ark play set. 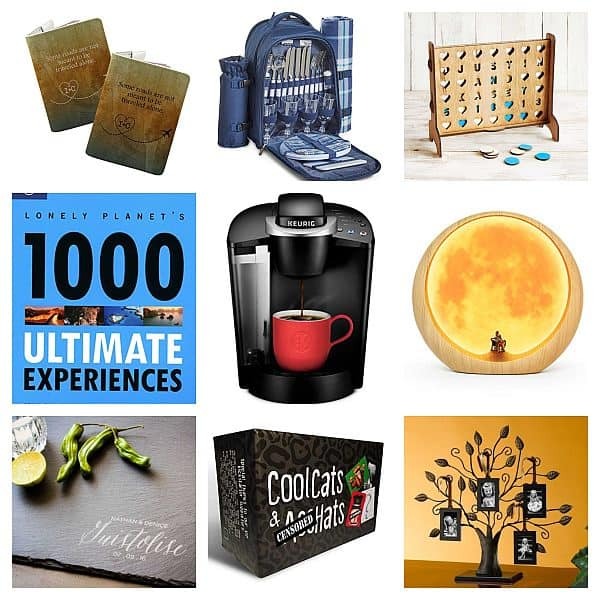 That kind of thoughtfulness adds an extra special something, as it shows how much time and care went into your gift giving.